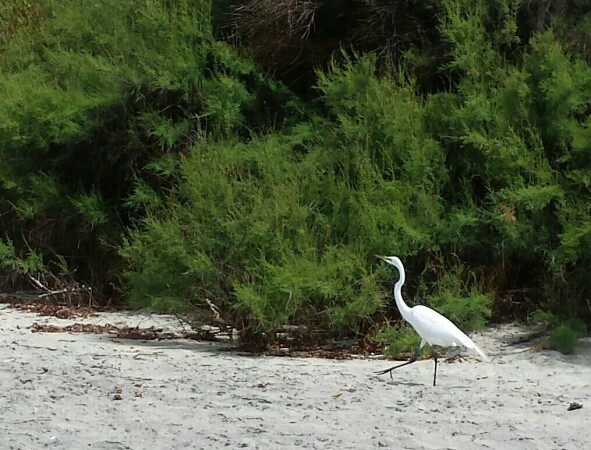 Just at the beginning of our beach time, a pleasant surprise: Mr. Harold Heron, in all his graceful gawkiness, lurching cautiously neck first across the sand, keeping toward the cliffs and away from us gawking walkers. Why does this bird speak of purity? Is it the contrast of stark white unruffled feathers and the black long legs? Is it the arch of the neck, seeming impossibly long? (Is he related to giraffes somehow?) Is it the slant of the body, the lovely diagonal line of the back? I don’t think it’s merely “whiteness” — at least, I hope it isn’t — it feels more connected to sleekness of form than simple color. And the S-curve of the neck accentuates that attention to line. Mr. Heron, you embody a lesson in calligraphy.